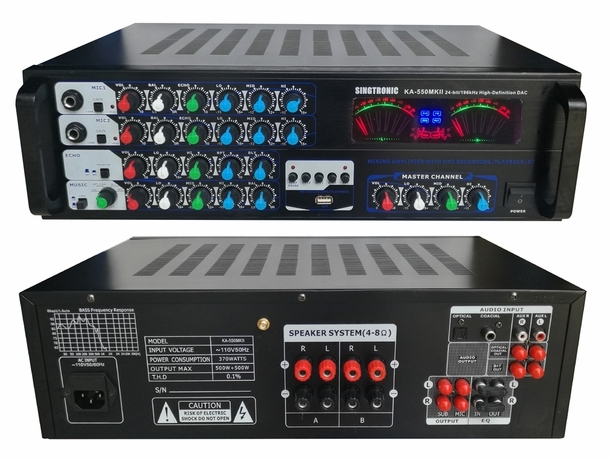 Newest Model: 2019 This Singtronic KA-550MKII Professional AV Karaoke Mixing Amplifier built in Optical & Coax Input with USB Recording Function & Bluetooth offers enough flexibility to make it perfect for a wide variety of applications. 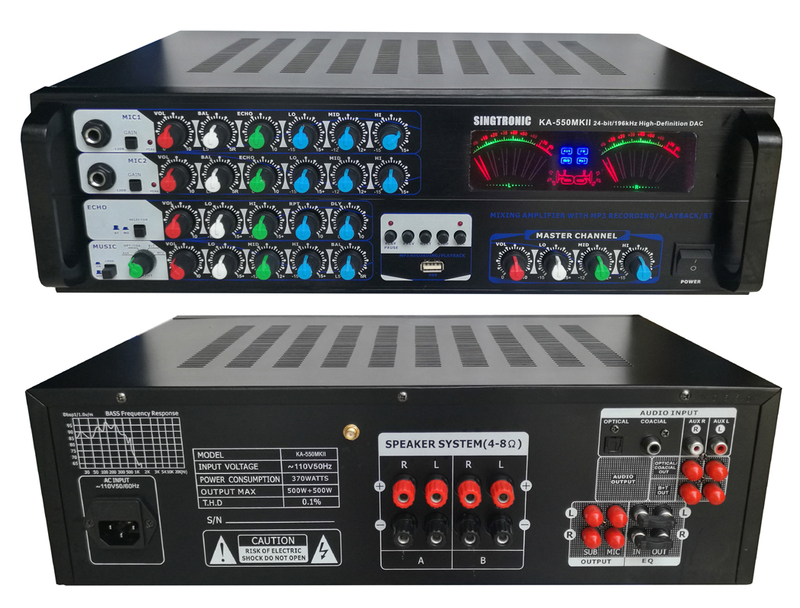 Its powerful 500W + 500W capabilities means that the KA-550MKII can easily drive 2 pairs of speakers at once powerful enough for just about any party or restaurant. If you're a home enthusiast and require crisp clean sound, this amplifier will provide you with quality sound. Design in Japan, the Singtronic KA-550MKII uses quality parts throughout to ensure that you'll always get top-notch performance. Oversized heat sinks keep the amp cool even when driving heavy loads, eliminating the need external cooling fans and guaranteeing silent operation. Newest Model: 2019 Bluetooth Function. Forgot your USB flash drive at home? Want to play audio files from your phone while keeping it safe in your pocket? No problem. The KA-550MKII's Bluetooth compatibility allows for wireless connection to any A2DP stereo Bluetooth device. That means you can play audio files from your phone, laptop or any other Bluetooth enabled device within a 30 foot foot range. The KA-550MKII gives you the freedom to stream music wirelessly from any Bluetooth enabled device. There are also a wide set of controls to help show off your mixing and production skills, such as the Bass, Mid and Treble. These inputs also display Track Title, Number and Elapsed Time to help you stay organized as you navigate through tracks.